I tried this new recipe last night and we all ate it up and enjoyed it. Even Hailey didn’t fight me and said she liked it. So, I thought I should share it. 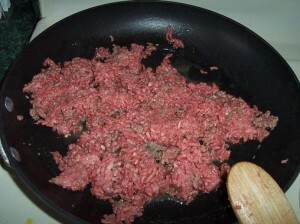 In a large skillet, cook beef, celery and onion until meat is browned; drain. Stir in taco mix, water, beans and green chilies if desired; mix well. Pour into a 2-1/2-qt. baking dish. Bake, uncovered, at 350 degrees F for 30 minutes or until heated through. Top with cheese, green onions, tomato, olives and chips. This is a yummy, easy and quick recipe. In a large saucepan, cook beef and onion over medium heat. Add soup, garlic salt, salt and pepper; simmer, uncovered for 5-10 minutes. Meanwhile, slice the top third off the bread. Hollow out bottom half of loaf, leaving a 3/4-in. shell (discard removed bread or save for another use). 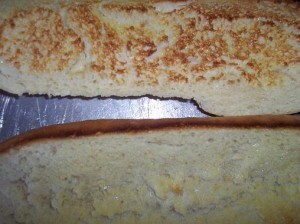 Spread butter on cut side of bread. Place loaf on an ungreased baking sheet and broil 4-in. from the heat until lightly browned. 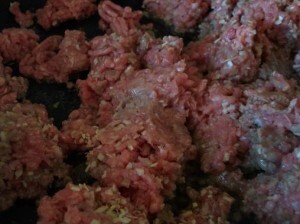 In a large skillet over medium-high heat, brown the ground beef and drain excess fat. 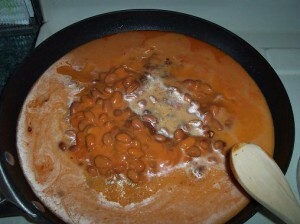 Stir in the taco seasoning, chili beans and French-style dressing. 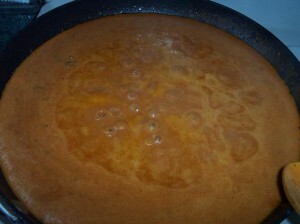 Fill the dressing bottle 2/3 full of water and add to the skillet. Bring to a boil, reduce heat and simmer for 15 minutes. 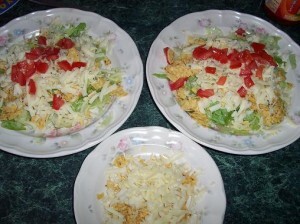 Crush the bag of chips, open the bag, and toss the broken chips into a large bowl with the lettuce, cheese and tomatoes. When the meat mixture is done, combine it with the lettuce, tomatoes, chips and mix well. Then, add salsa and sour cream. 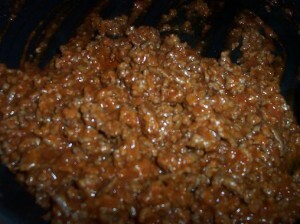 So, here we have the ground beef. 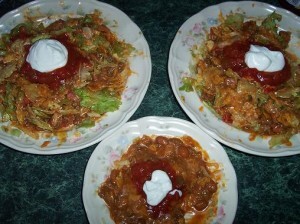 Stir in the taco seasoning, chili beans and French-style dressing. Fill the dressing bottle 2/3 full of water and add to the skillet. Bring to a boil, reduce heat and simmer for 15 minutes. Eat and enjoy- it’s really very delicious! So, when I started this blog I said I was going to post some recipes. And I’m sure all of my faithful readers have been waiting for me to post a recipe or two. Oh, who am I kidding? I haven’t even told anyone about this blog yet, so I’m pretty sure I don’t have any readers at all. hee hee. Anyways, in case I do one day have some readers, I thought I should keep my word and post a recipe or two. 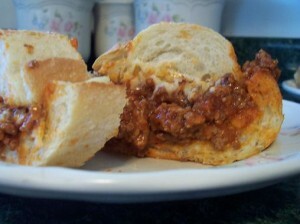 The recipe that I’m sharing is Rich’s favorite meal that I make. I make it almost every Sunday. I start it in the morning when I get up and then that afternoon after church we always have a nice big Sunday dinner. It literally takes me less than five minutes to get it started. 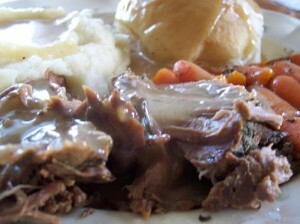 Place pot roast into your slow cooker. Mix Worcestershire sauce and beef bouillon granules into water, pour over pot roast. 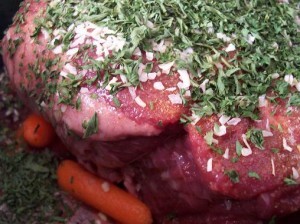 Sprinkle pot roast with seasoning salt and garlic salt to taste. Cover and cook on high-heat setting for 5-6 hours or on low-heat setting for 10-12 hours. Sometimes I also add baby carrots (put in slow cooker first and then put pot roast on top of the carrots). Then we have mashed potatoes, rolls, and salad. Rich always makes gravy using the juices from the pot roast too.